NY: McGraw-Hill, 1989. First edition. Hardcover. Good in VG dust jacket. Hardcover with edge wear, clean, binding shaken, but covers firmly attached; light foxing to top edge; former owner's name/date/city on title page with ink notes, text contains off and on ink markings; light wear to dust jacket, not price clipped. A very good reading copy, selling as-is. McGraw-Hill Companies, The, 1989. Hardcover. Good. Disclaimer:A copy that has been read, but remains in clean condition. All pages are intact, and the cover is intact. The spine may show signs of wear. Pages can include limited notes and highlighting, and the copy can include previous owner inscriptions. At ThriftBooks, our motto is: Read More, Spend Less.Dust jacket quality is not guaranteed. McGraw-Hill Companies, The, 1989. Hardcover. Very Good. Disclaimer:A copy that has been read, but remains in excellent condition. Pages are intact and are not marred by notes or highlighting, but may contain a neat previous owner name. The spine remains undamaged. At ThriftBooks, our motto is: Read More, Spend Less.Dust jacket quality is not guaranteed. Jim Hughes, 10/01/1989. Hardcover. Used; Good. **WE SHIP WITHIN 24 HRS FROM LONDON, UK, 98% OF OUR ORDERS ARE RECEIVED WITHIN 7-10 DAYS. We believe you will be completely satisfied with our quick and reliable service. All orders are dispatched as swiftly as possible! Buy with confidence! McGraw-Hill Companies, The, 1989. Hardcover. Acceptable. Disclaimer:A readable copy. All pages are intact, and the cover is intact. Pages can include considerable notes-in pen or highlighter-but the notes cannot obscure the text. At ThriftBooks, our motto is: Read More, Spend Less.Dust jacket quality is not guaranteed. Jim Hughes, 1989-10. Hardcover. Good. New York: McGraw-Hill, 1989. First printing. 8vo. 606 pp. Near Fine in Very Good dust jacket. Faint scratch to front board. Unobtrusive 2" cut to jacket's front panel, slight shelfwear to extremities. 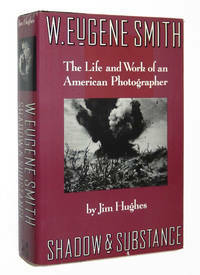 Review copy with publisher's letter and publicity photo by Eugene Smith laid in.. First Edition. Hardcover. Near Fine. Jim Hughes, 1989-10-01. Hardcover. Good. This is a good ex/library hardcover without dust jacket. Pages are clean and crisp. Book shows edge wear. Some library markings. Daily shipping. New York: McGraw-Hill Publishing Company, 1989. Book. Near Fine. Hardcover. First Edition - First Printing. New York: McGraw-Hill, 1989. First printing. Hardcover. Fine/near fine. First printing, review copy with photo reproduction and review slip laid in, 1989, hardcover, thick octavo, 606pp., illustrated in b&w. Book fine, binding tight, text clean and unmarked. DJ near fine with mild shelfwear, looking fine in protective mylar wrap. New York: McGraw-Hill, 1989. Second printing. Hardcover. Near Fine/Very Good+. Signed by Hughes! Second printing, 1989, hardcover with cloth-backed boards in dust jacket, octavo, 606pp., illustrated in b&w. Book near fine with handsome boards and tight binding, previous owner's inscription to full-title, otherwise text clean and unmarked. DJ VG+ with mild rubbing, front flap price-clipped, in protective mylar wrap. New York: McGraw-Hill, 1989. Hardcover. SIGNED. First edition, first printing. Very Good+ hardcover with light signs of handling in a Very Good dust jacket with a touch of fading to the front and spine, a couple of tiny tears, and light shelf wear. All dust jackets are protected by a clear mylar cover. BOOKS SHIP THE NEXT BUSINESS DAY, WRAPPED IN PADDING, IN A BOX. 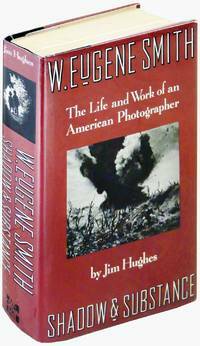 A biography of the photojournalist W. Eugene Smith. Text by Jim Hughes. 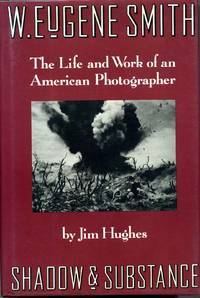 SIGNED BY HUGHES to the ffep, inscribed to Cornell (Capa), and dated in the year of publication. 638 pages; frontis + 32 pages of b&w plates; 6.25 x 9.25 inches. Notes, index. New York: McGraw-Hill, 1989. First edition. First Printing. Hardcover. Near Fine/fine. 606 pp. 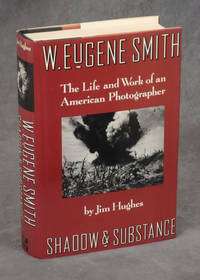 Signed and inscribed ("The spirit of Gene Smith lives on in words & pictures, Jim Hughes") on title page. Spine ends bumped, otherwise Fine. Dust jacket is protected with a Brodart archival cover. Jim Hughes. Hardcover. 0070311234 New Condition. . New. Jim Hughes. Hardcover. 0070311234 Like New Condition. . Fine. New York: Jim Hughes, 1989. Book. Fine. Hardcover. 1st Edition. First Edition. Thick octavo, black cloth spine over plum colored cloth covered boards. 606pp. including index and extensive notes. 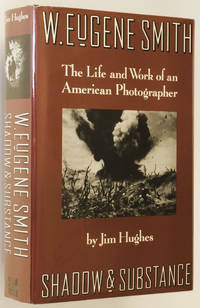 Illustrated with rare (in book form) reproductions of Smith's work in black and white, including self portraits and some of his most famous photographs of war, workers and the common man. A tight, clean, fresh, unmarked and unblemished volume in a crisp, sharp, bright price-clipped dust jacket. Fine in a fine dust jacket..
New York: McGraw-Hill Publishing Company, 1989. Book. Near fine condition. Hardcover. First Edition. Octavo (8vo). xvi, 606 pages of text including an index. Hardcover binding. Unclipped dustjacket with minimal shelfwear; protected in archival mylar. Contains 46 black & white photographs..
McGraw-Hill Publishing Company, 1989. Hardcover. Near Fine in Near Fine dust jacket. Hardcover. SIGNED & INSCRIBED BY AUTHOR. The inscription reads: "For Deborah - with deepest gratitude for your ... efforts. The spirit of Gene Smith lives on." Black cloth backed maroon paper covered boards with silver title to spine. Clean, bright interior with illustrations. Minor wear to edges of boards, else fine. Maroon dust jacket with white title to spine and front panel. Minor wear to corners of jacket and light rubbing to panels, else fine. Index, 606 pages. PHOTO/081506. Jim Hughes, 1989-10-01. Hardcover. Used:Good.